In my wanderings around town lately I’ve heard many people bemoaning the end of summer and the cooler weather that’s settling in. I smile and say nothing, knowing that my opinion is in the minority currently. But when someone comments on the “end of all the really good summer food” I can’t keep quiet. Just because it gets colder doesn’t mean you can’t enjoy some of your favorite summer foods! In my family we have ALWAYS grilled over the winter. We make sure we have a sheltered spot for the grill and go for it! Here in South Dakota that may have to change because the wind is so severe, but that’s ok. Sometimes instead of being the familiar, char-grilled food we’re accustomed to, our favorite summer foods must get a wardrobe change. Enter: Sticky Sausages. I found the original recipe on a blog from the UK and changed it to work for my family. The original called for English or Irish bangers- sadly thin on the ground here. Instead, I use bratwurst. They work perfectly! You can even play around with flavored brats if you want. Find your favorite and use it. You may have to buy some extras during the summer and freeze them though. I know in Colorado they really only sell brats at a good price during the summer. Here is South Dakota there are so many people of German and Polish decent it’s not a problem. You could use pancake syrup instead of real maple syrup if that’s all you could get. It would certainly be cheaper. But it would add a little too much sweetness and it’s… well… fake. So if you can, use real maple syrup. You don’t want the bacon really crispy for this. There are two reasons for that: 1) Crunchy bacon throws off the texture of the final dish and 2) The fonde on the bottom of the pan would burn by the end and no one wants burned-bacon-flavored brats. Yuck. While the bacon is cooking, mix your sauce ingredients. If you heat the honey you’ll have an easier time of it- especially since the other ingredients are cold. You can do that in the measuring cup if you use a glass one or you can heat it in the bowl you’re making the sauce in. 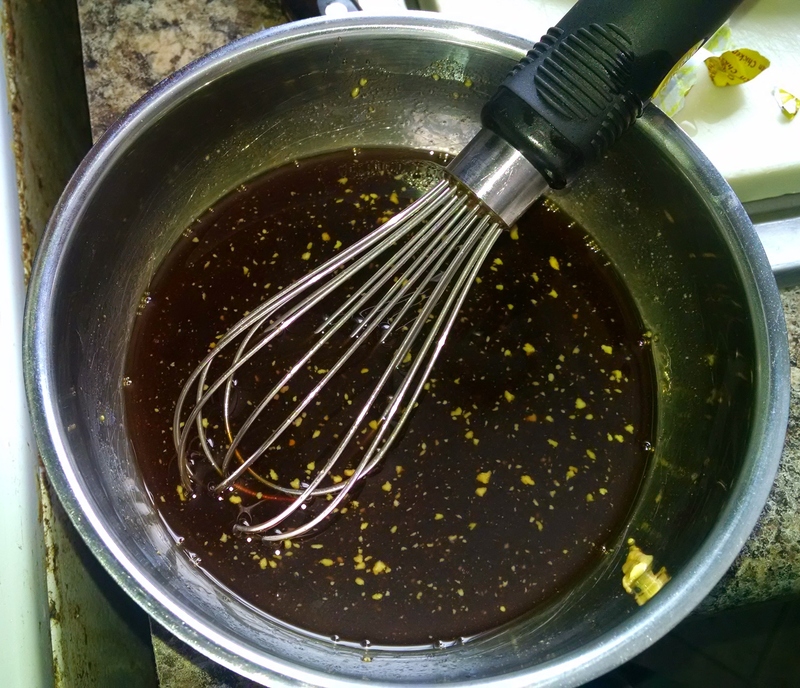 I use a metal bowl to mix the sauce, so I heated the honey in a glass measuring cup. Anyway, whisk the sauce together. 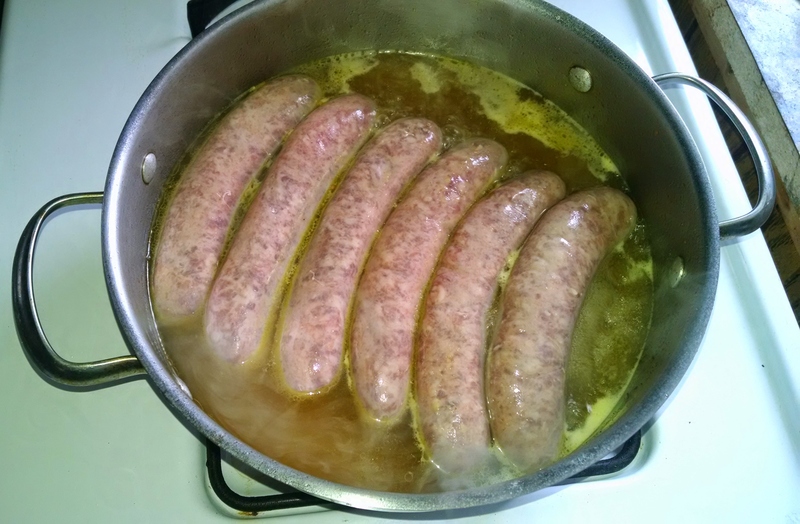 I used about 2 cups of broth for 6 brats. Now put a lid on this and let the brats boil for about 5 minutes, then turn the brats, put the cover back on, and cook for another 5 minutes. Then you can drain off the liquid. Aren’t those handsome? Now we set those beauties aside and use the very same pan to boil the sauce. Pour the mixture into the pan and set over medium heat. Bring it to a boil and stir fairly regularly. You’re dealing with a sauce with a high sugar content, so it will burn if you put it over high heat or don’t give it a good stir pretty often. It will bubble up in the pan- don’t worry. You’re using a big pan so it won’t boil over. 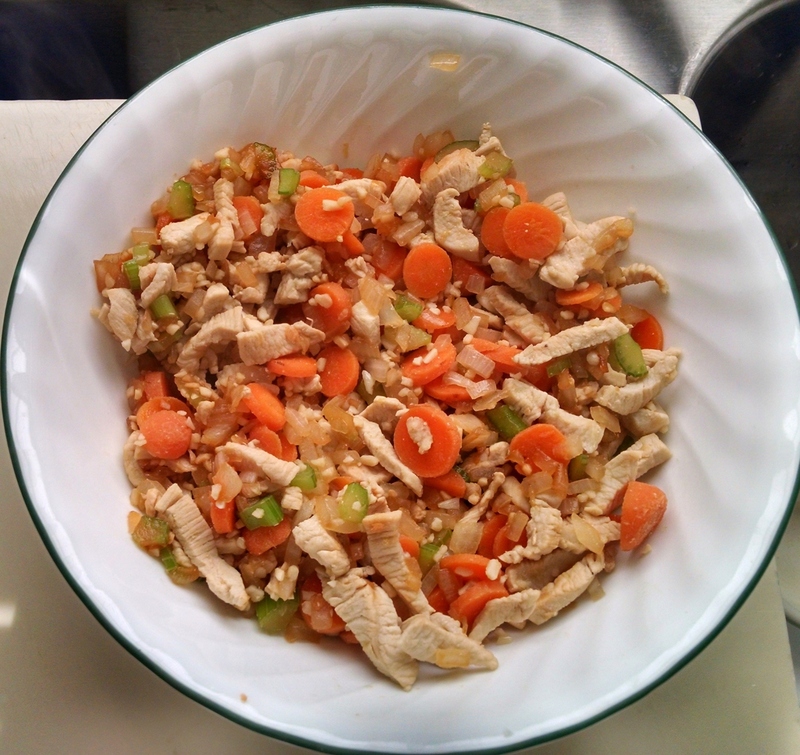 Cook this until it’s thickened. How long that takes depends on your stove and a lot of other things. So keep an eye on it when you stir it and when it’s a bit thicker than when you started, add the bacon and brats back in. Stir everything around so the brats are coated and heated through again and then take the pan off the heat and let the whole thing sit and cool. You’re dealing with a molten sugar mixture- IT WILL BURN YOU BADLY if you try to eat it right away. Let the pan sit for about 10 minutes before you even try to serve these. Even then it will be hot, so be careful. 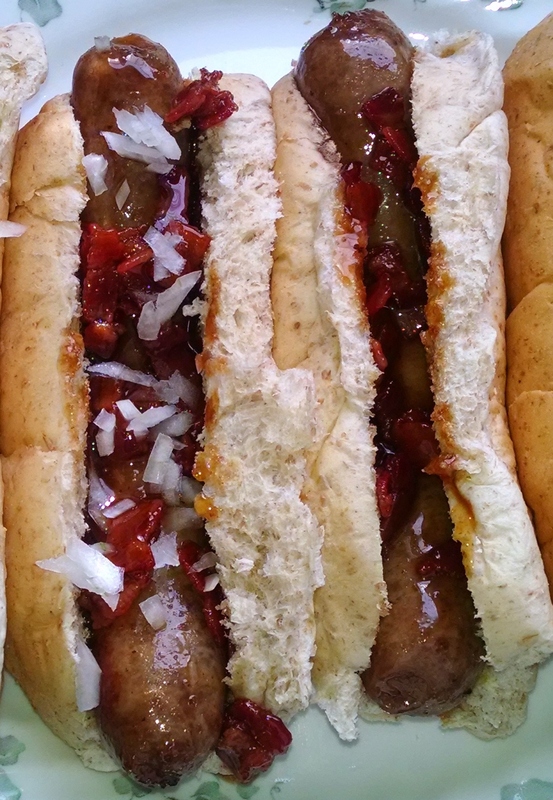 Caramelized onions are wonderful on these brats, but I prefer the sharp contrast of raw onion. Ron and the kids prefer theirs straight up. Feel free to play around and use what you like. 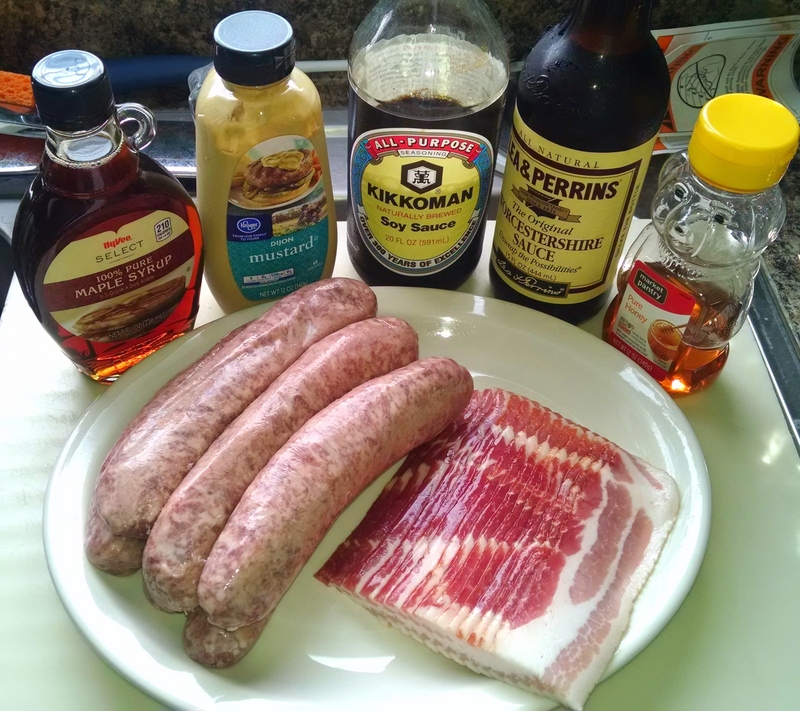 I keep talking about the fact that you’re cooking a sugar mixture and, while it’s true that there are 2 super sweet substances in the sauce, these sticky sausages are NOT as sweet as you would think. The bacon, soy sauce, Worcestershire sauce, and mustard add a deep, beautiful savoriness that tames the sweetness. These really aren’t any sweeter than your average honey baked ham. And they are just perfect for an autumn get together of any kind. You can multiply this recipe as you need to and keep the whole thing warm in a foil covered pan in a low oven (about 180-200F) or on very low heat. *Fry bacon until just done. Drain (reserve the drippings to cook with later) and set aside. * While bacon is cooking, mix the sauce ingredients together. Don’t worry if the mustard won’t whisk in. 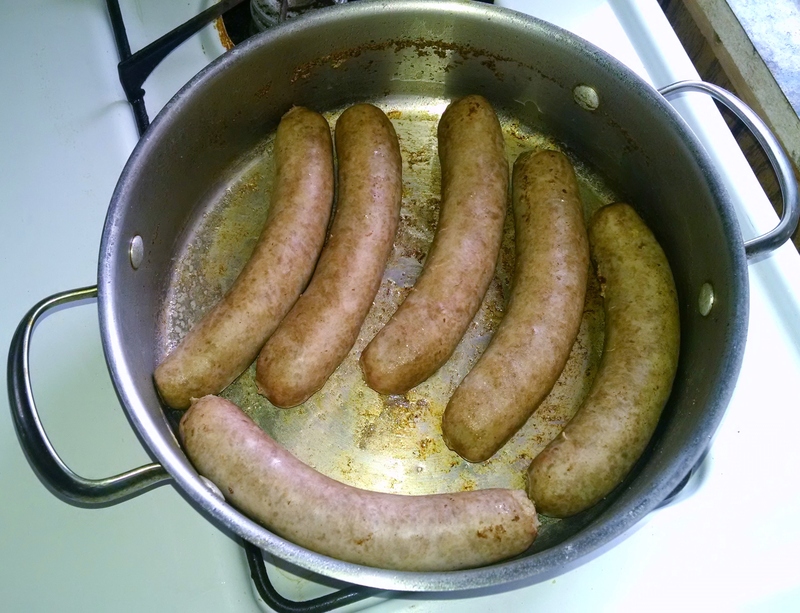 *Add raw brats to pan over medium heat. *Pour broth, beer, ale, or a mixture of those over the brats, coming just up to the top. You don’t have to cover the brats. *Cover the pan and bring to a boil. *Boil 5 minutes, turn, and boil another 5 minutes. *Remove brats and drain the pan. Do not wash the pan. 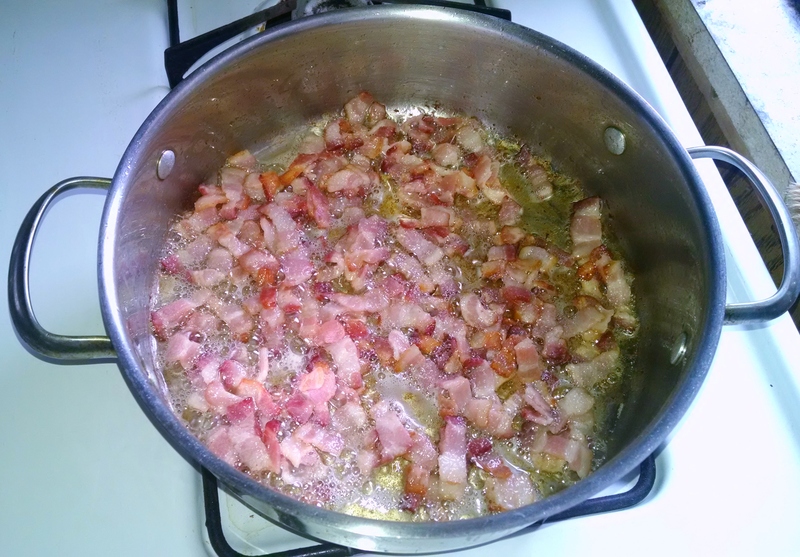 *Add bacon fat to the pan, to coat the bottom in a thin layer over medium heat. 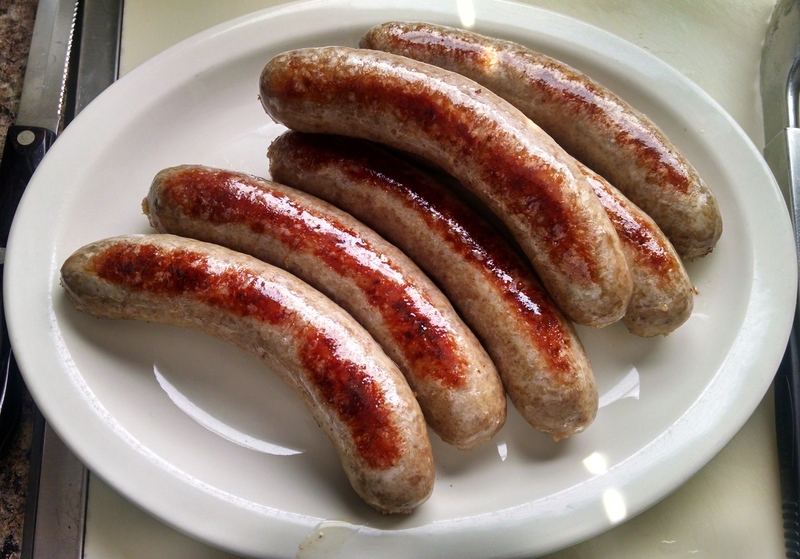 * Put the brats back in and cook about 3-4 minutes on each side, until they are a deep brown on both sides. *Remove the brats to a plate and set aside. *Into the same, unwashed pan, pour the sauce ingredients. * Cook, stirring regularly, until the mixture thickens. *Add the brats and the bacon back to the pan and stir to coat and heat the sausages through. * Take the pan off the heat and let cool for at least 10 minutes before serving. It’s that time of year again; the weather is getting cooler (well… it is here, anyway), school is back in session, and pretty soon it will be time to close the windows up for cold weather. All of that adds up to one thing: outbreaks of cold & flu bugs. While it’s true that people can get colds any time of year, they always spike when the weather gets colder and school is back in session. Lots of kids + enclosed space with little ventilation = Everyone gets sick. The little germ mongers just can’t help it when it comes to spreading bugs around. So, try as you might, the odds are that you and those you love will get sick. It just so happens that I have something to help with that. And it’s much tastier than Ny-Quil! Ok, it won’t replace the Ny-Quil. But it will help wash the nauseating Ny-Quil taste out of your mouth. 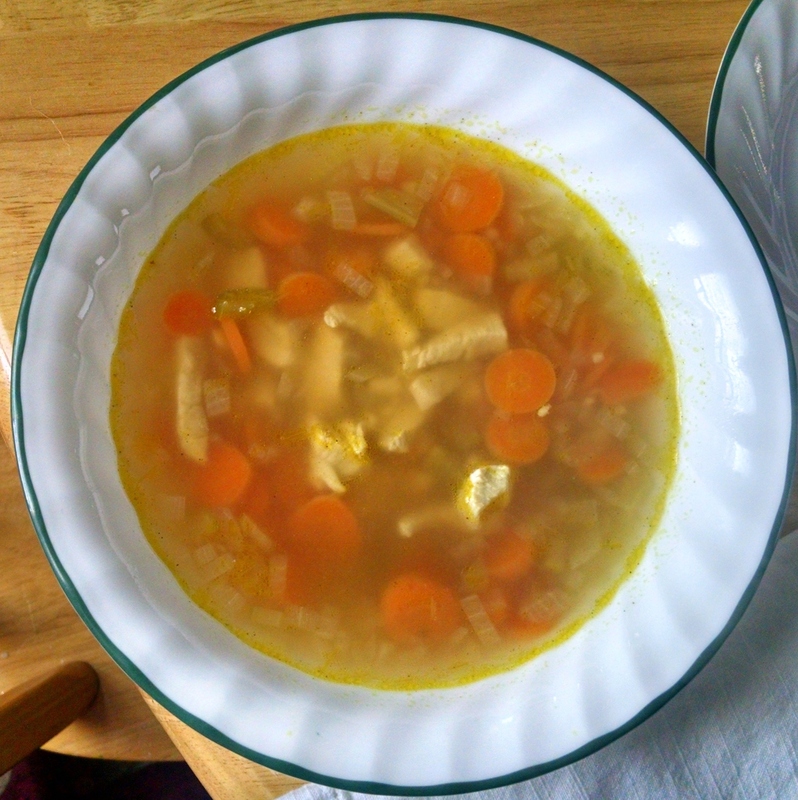 It’s been proven that chicken soup really does help combat the cold & flu bugs. The protein from the chicken helps strengthen the body in it’s fight against the bugs, the liquid from the broth fights dehydration, and the garlic is a natural bug fighting powerhouse. If you look up the homeopathic properties of garlic, you might just be amazed. Garlic is an awesome superfood! (Here is a great starter article on the awesomeness of garlic.) I came up with the recipe for this soup when a dear friend was sick and I wanted to help her feel better and not have to cook her own dinner. I had never made chicken soup before in my life, but I knew the basics. Really, I just started throwing things in the pot and added salt & pepper until it was just right. My friend LOVED it and when my husband tasted it he told me “you’d better remember what you put in this because it’s amazing and there isn’t enough left over!” Thus was born a chicken soup so good that it garnered the compliment “people pay a lot of money in restaurants for soup that isn’t as good as this!” Yeah- it’s that good. Make it, sick or not, you won’t be sorry. I used baby carrots because I already had some on hand. You can certainly use regular sized carrots and just dice them. I suppose if you really wanted to, you could even use frozen diced carrots. If you’re making this when you’re already feeling under the weather, that would be a great shortcut. I also use as little celery as I can. Typically I can’t stand celery. But it’s vital for this soup. I’ve made it without celery once before and it just didn’t taste right. So I use one extra large or 2 smaller ribs. 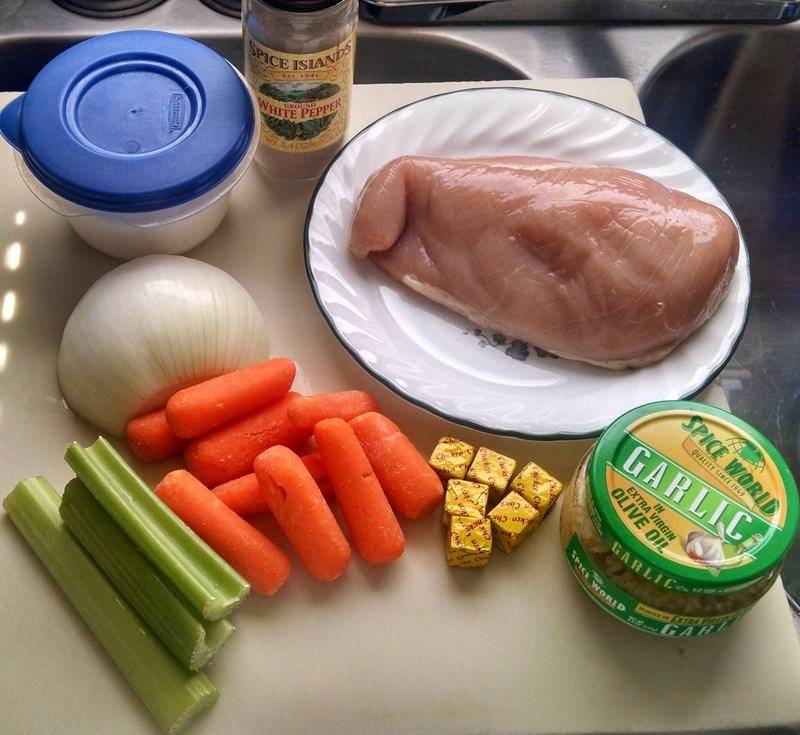 I’m making a half batch of this soup, so I have only one chicken breast pictured. That would be about half a pound of chicken. You can also use boneless, skinless chicken thighs if you’d prefer. I can’t stand gristle and sinew, so I rarely use them for anything (this recipe is the only one I can think of that I use thighs). There are 2 ways you can cook the chicken for this recipe: dice it small and fry it in the soup pot, or simmer it for a few hours in the broth you’ll use for the soup and shred it. I’ve done both and both work very well. I suppose it depends on if I have the time to simmer it and don’t want to get my hands all chicken-y (yes; even The Humble Food Snob gets lazy in the kitchen sometimes!). But dicing the chicken fine and frying it in a tiny bit of oil in the soup pot adds some very rich flavor (because of the fonde at the bottom of the pan- the browned bits that come up when you add liquid and deglaze the pan). Start out by dicing your veggies and mincing the copious amount of garlic. Keep the garlic separate but mix all of the other veggies. Then dice your chicken. It needs to be in very small pieces so that it gets evenly distributed in the soup. Add a VERY small amount of oil to your pan. For half a pound of chicken I’ll use a scant 1-2 teaspoons of oil. If the chicken sticks to the pan a bit it’s ok- the bits will come up when you add the broth. What’s more important is that you don’t have an oil slick on the top of your soup. There is nothing in the soup to soak up the oil and incorporate it; you’ll have to skim the top to get rid of the excess if you use too much. So fry your chicken over medium high heat. Next, add your veggies all at once, except the garlic. Stir everything together and cook until the onions are a bit soft, maybe about 3 minutes. Now you can add the garlic. 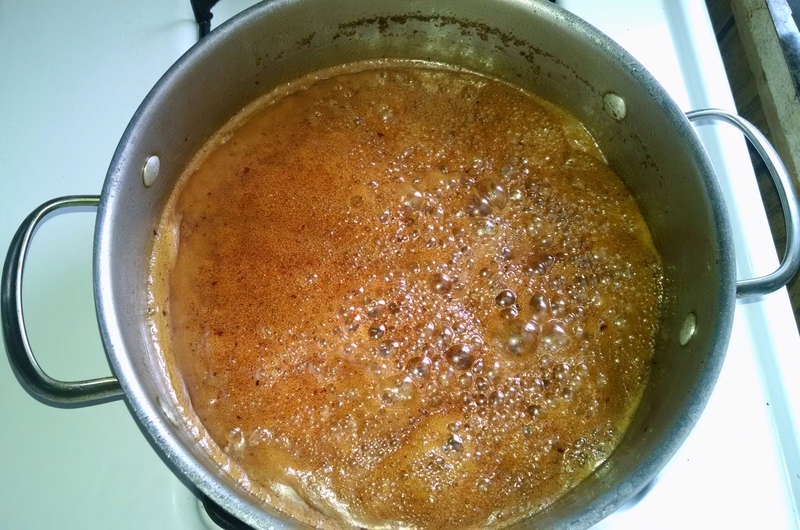 But it only needs about 30-45 seconds, so be ready to either transfer the mixture to a bowl to make the broth (like I am because I’m using bullion cubes) or pour the broth in directly. You want the raw edge just barely taken off the garlic in the mixture- boiling the soup will cook it the rest of the way and give a distinct flavor to the soup. After adding the broth, add a good pinch of salt and a sprinkling of white pepper. I give it a good dose of pepper by the end and that’s part of what makes it so good. It’s almost spicy, but not overpowering. Also good for cold & flu sufferers as it opens the sinuses some. Just be sure to use white pepper and not black. Black pepper is harsher than white and no one wants little specks of what looks like dirt in their soup. Now give it a stir, cover it, bring it to a boil, then back it down to a fast simmer and cook until the carrots are tender. That usually takes about 20 minutes for me, but just keep an eye on it. Every 10 or 15 minutes, fish out a carrot and give it a poke with a fork or knife if you’re unsure whether or not they’re done. Doesn’t that just look like a steamy pot of comfort?? And it smells soooo good! The aroma actually brought the girls out of their bedroom to investigate and they were thrilled that we were having this soup. Kids love it! Once the carrots are done, turn off the heat and give the soup a taste. Add more salt and pepper if you think it’s needed, and serve. A good yeasty, soft roll is excellent with this soup. Or you can go with a thick, crusty bread to dip in the broth and use as a sop for the last dregs of soup at the end of the bowl. If you want to, you can certainly add a starch to this soup. I’ve never liked chicken noodle or rice soup. But if that’s your thing, then by all means; add some noodles or rice. You could even add some barley if you have it. This soup really is like a loving hug in a bowl. And, of course, you don’t have to be sick to enjoy it. It’s perfect for the cold nights that are coming. This is a perfect soup to serve to those you love after a day of enjoying the turning colors or picking apples in the brisk fall air. And this winter you won’t find anything much better than this soup for curling up with and watching the snow fall. So please; make this soup and share it with those you hold dear. It might just make them feel better. And it will certainly make them feel loved. *Heat the oil in a soup or stock pot over medium high heat. Watch it; that small amount of oil will heat fast and burn quickly. *Add the chicken and cook until slightly browned. If it sticks a bit and tears, don’t worry; the bits will come up when you deglaze the pot with the broth. *Add the onion, carrots, and celery. Cook 3-4 minutes, until the onion is softened a bit. *Add the garlic and cook 30-45 seconds. 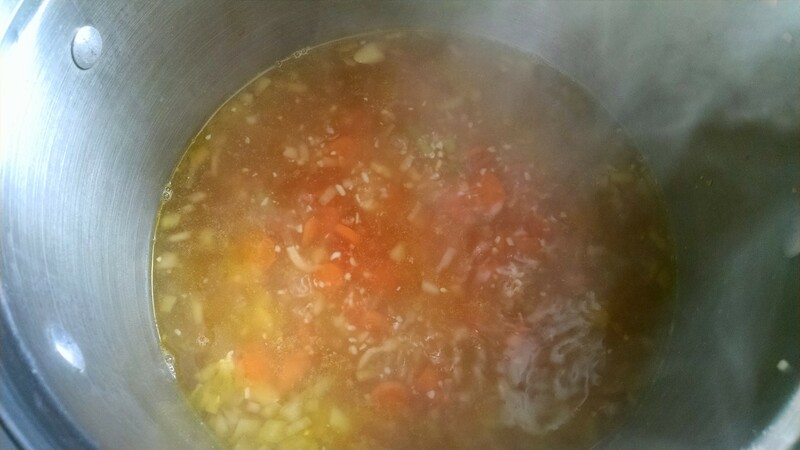 *Remove the mixture to a bowl to constitute broth if using bullion cubes, or add the ready broth to the pot with the meat and veggies. *Return the mixture to the pot if it had to be removed. *Season with some salt and white pepper, but don’t overdo it. You’ll adjust this later too. *Bring to a boil, then back off to a fast simmer. *Simmer until carrots are cooked through, 20-30 minutes. *Turn off the heat and check for seasoning. Add more salt and white pepper if needed. *Serve with a good bread.